Successfully Added Mini S3 Bluetooth Earphones - IPX7, BT4.2, Hands Free, Noise Reduction, 45mAh Battery, 440mAh Charge Box to your Shopping Cart. The Mini S3 is a sleek and compact pair of earphones with clever magnetic charging box and carry case. Each ear phone has a 45mAh battery built in and being completely wireless you have total freedom in your listening experience so you needn't worry about tangled wires ever again. The magnetic charge box and carry case holds a 440mAh battery and lets you safely store and recharge the earphones when not in use. Coming with different size soft silicon ear tips the Mini S2 earphones are suitable for all and offer a snug and secure fit that will keep them in place even as you work out. With a one-button design you can answer or hang-up calls, switch tracks and manage your music all at the touch of a button. So you can keep your phone tucked away and enjoy a hands-free experience. Ideal when working out or behind the wheel. 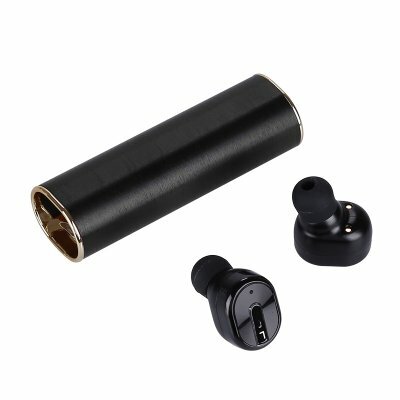 You can use these earphones with Bluetooth equipped devices such as iOS or Android phones and with its efficient power usage and strong signal you get great connectivity and long usage times. The earphones also offer great noise reduction so you can listen to your favorite tracks without any interference. Having an IPX7 waterproof rating means the earphones themselves are fully waterproof. This allows you to wear them when working out or even in the shower without any worries about wear compromising their performance. The Mini S3 Bluetooth earphones come with 12 months warranty, brought to you by the leader in electronic devices as well as wholesale earphones and headphones..